Hey lovelies, I hope you are all doing well and enjoying this beautiful day. So, I know Valentine's Day was just a couple days ago but, it's never too late to gift something special to your loved ones. I think you can't go wrong with bath and body items, and Soaptopia has lots of great gift sets to choose from. Take for instance their Love Scrub gift set ($33.00) which includes a body oil, a body scrub and a bar soap, all with a yummy rose geranium and vanilla scent. You even get an adorable heart-shaped pumice stone (my press sample came with a heart-shaped loofah sponge, instead). All of the goodies are housed in a super cute travel-friendly, natural bag. 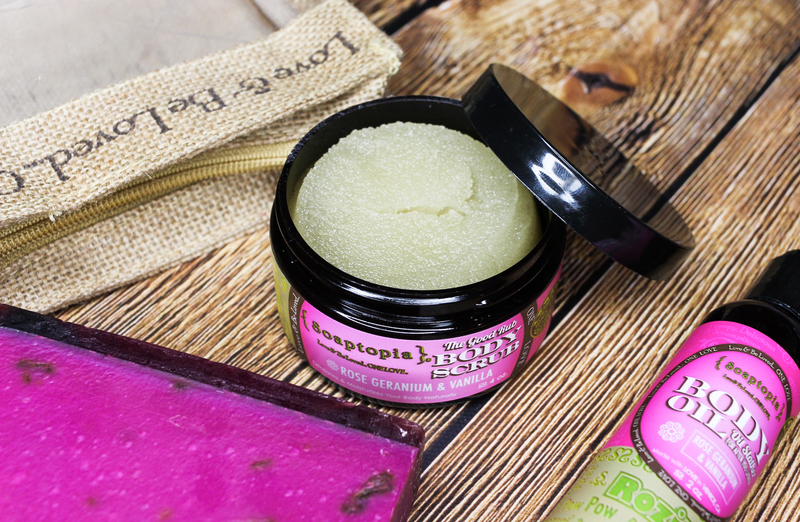 The Good Rub Rozilla Body Scrub: This body scrub is so delightful! It does an amazing job at exfoliating and softening my dry, winter skin. Not to mention, it's super hydrating as well. Rozilla Oil Slather: I am a huge fan of Soaptopia's Oil Slathers-I reviewed a few here. They are moisturizing, they smell amazing and they sink beautifully into the skin without leaving behind a greasy residue. Definitely a must have. 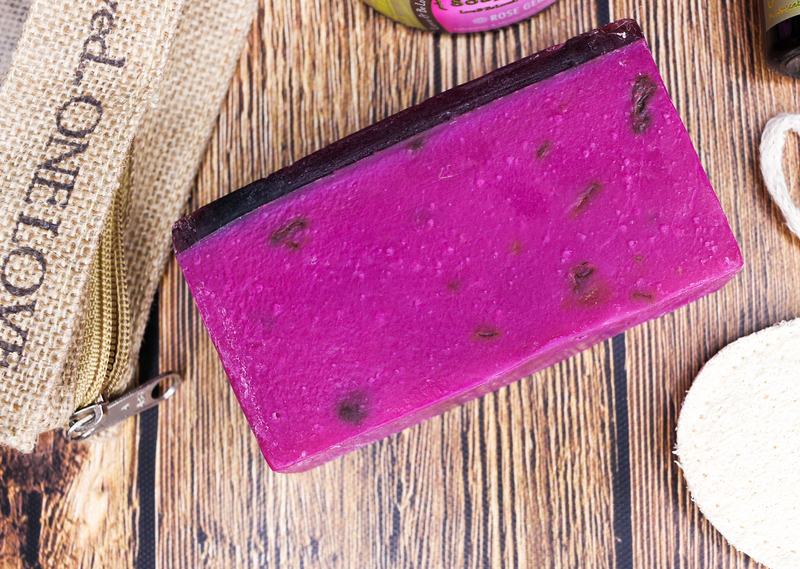 Rozilla vs. Dry Skinea Artisan Soap: Soaptopia's handmade soap bars are such a treat to use. They don't dry out my skin, and I love that they are all natural and made with the best ingredients. 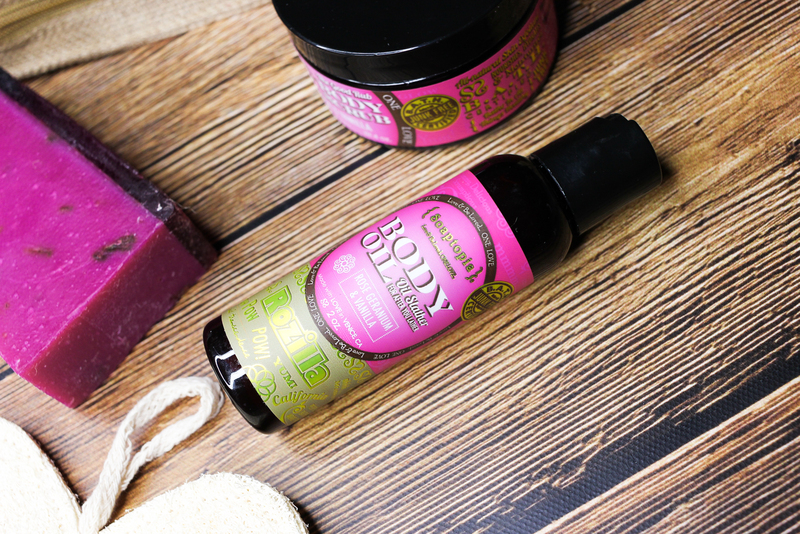 Head on over to Soaptopia and check out more gift sets, as well as their extensive range of skin and body care offerings. You are bound to find something new to love! Any Soaptopia products on your list to try?